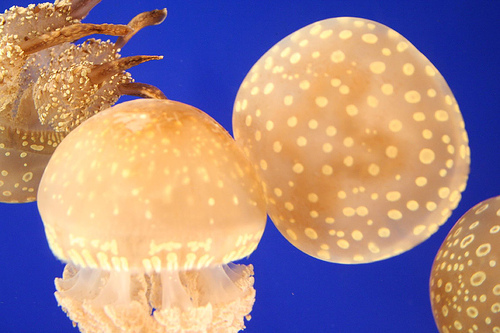 The White Spotted Jellyfish or Phyllorhiza punctata, is a native of Australia and is also known as the Australian spotted jellyfish. It grows to the size of about 45-50 centimeters in diameter, and is ocassionally known to grow to a maximum length of just a little over 60 centimeters in size. They look extremely beautiful with the design of white spots over their translucent gelatinous body and their frilly oral arms add another aspect of charm to their appearance. Additionally, they are fairly harmless and their sting contains only mild venom which does not cause any serious effect or reaction in humans. Application of StingMate can cure the little burning sensation that may be caused by the sting. This jellyfish is an eating machine filtering 13,200 gallons of sea water a day devouring plankton. The white spotted jellyfish has involuntarily migrated to the Gulf of Mexico. It is believed that the animal may have gotten trapped in the ballast tank of a marine vessel and got transported to the Gulf of Mexico where they can now be found in large numbers. The native marine species in the Gulf of Mexico are now beginning to face the problem of non availability of plankton due to the presence of the white spotted jellyfish.